Undisputed Fight Night and Combat Night are teaming up to bring you the best in live combat sports. We will have a boxing ring and an MMA cage in the same venue with non stop action for your viewing pleasure. 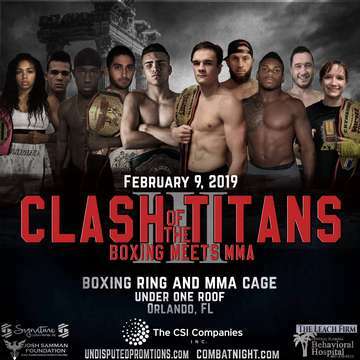 Boxing favorite and Undisputed Promotions Champion Danny Suarez will be taking on the main event for the evening along with Combat Nights very Own Champ, in addition to several other fighters making the transition into the cage or ring to prove their sport is the superior one!